Waimea Canyon - Aerial view via drone. Pu’u O Kila Lookout - End of the climb, top of the world! Waimea Canyon is one of the most beautiful places on earth, in our opinion, anyway! The canyon is about 10 miles in length and 3,000’ deep. “Waimea” means “reddish water” in Hawaiian. The canyon has a unique and spectacular reddish hue to it - quite scenic. This bike climb is through Waimea Canyon State Park consisting of 1,866 acres. Waimea Canyon is referred to as The Grand Canyon of the Pacific. Waimea Canyon Lookout - 10.5 miles up the Kokee route. You can stop anywhere you want! This photo taken at mile 10.8 by hopping the guardrail. Pu’u Hinahina Lookout - 13.8 miles up the Kokee Route. Waipo’o Falls through framed by our spokes. Much of the movie, Jurassic Park, was filmed in Waimea Canyon, including the famous helicopter canyon/waterfall scene. The traditional and more popular route up Waimea Canyon is via Kokee Road - ride 19.2 miles to elevation 4,193’ gaining 5,119’’ at 4.1% average grade. The steepest ½ mile on this climb beings at mile 15.8 (8.8%). Ride through a mini canyon during our first 6 1/2 miles up the Kokee route. The less traveled bicycle route up Waimea Canyon is via Highway 550 - ride 18.7 miles to 4,068’ gaining 4,486’ at 4.2% average grade. The steepest ½ mile on this climb begins at mile 15.4 and is 8.5%. I took route 552 (aka Kokee Road - PJAMM note - we have charted this route - MAP - also see RideWithGPS map at bottom of this Climb Page) out of Kekaha, steadier grade overall with less steep roller/kicker sections than route 550 (the actual Waimea Canyon road). I did this not to avoid steepness but because it gets less traffic than 550. The 552 was redone a couple years ago and was in great smooth condition when I rode it. Little to no shade on the climb, and even mid- November I saw as high as 100 degrees on the garmin. Kinda reminded me of some of the classic top ten ranked climbs of the southern sierras as far as unshaded desert-like terrain and heat. After about 6.5 miles, 2300', @ 6.7% the 552 intersects WC road. This first section is the most difficult part of the route. (and would be from the WC side as well- most of the steepness and overall elevation is gained in the early part of the route, sort of the reverse of many hawaiian climbs. From the intersection of the 550 and 552 you're pretty much right on the spine of the ridge for the next 7 miles, 1250' @ only 3.3%. This section has numerous viewpoints of the canyon off to the right as you ascend, which makes checking out the scenery easy, just pull over and look at the majesty. It also provides treed sections for shade relief if it's a sunny hot day, and there is at least one restroom/water fountain facility in this section. After the 7 mile middle section you reach Makaha road, a side road that is a dead end drop to the left (west) when ascending. I did it on the return, will describe it then. From the Makaha road cut off it's just over 4 miles, 530' @ only 2.4% to the main Kalalau overlook area above the fabulous Na Pali coast, easy sounding stats but there's some rollers in there. There are bathroom facilities at Kalalau, but I don't recall a drinking fountain. There is a spigot out of the side of the building, but I was told it is unwise to drink from it, so at one's own risk regarding that. If it's clear up there you can see Niihau, the "forbidden isle", however it's often very mist-shrouded in this area. 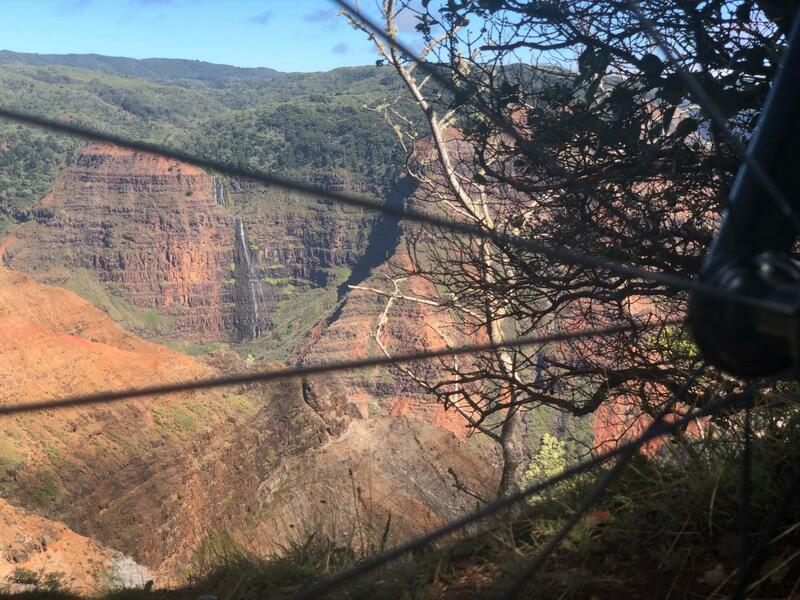 Many reference this as the top/summit/end of the road, as there is just beyond the Kalalau parking area a gate which I was told has been closed most of the time in years past because the road beyond was in terribly rough condition. No longer, however - it's been redone and was smooth and nice all the way to the true end of the road at the Pu'u O KIla lookout. This last section after the gate at the Kalalau lookout point is just over a mile, the end is not much higher but there are some more rollers in that last mile. So: overall stats from base of 552 Kokee road to the very end of the road at the Pu'u O Kila lookout are about 18.8 miles, 4157' @ only 4% avg. It didn't seem as easy as that 4%avg sounds though, with the numerous rollers. But I was on the mtn bike, so that certainly alters the subjective experience. Traffic above the 550/552 junction was heavier than the 552 below, but I felt totally safe all ride, motorists were courteous, no close buzzes, drivers often swinging wide left when passing and nobody was driving the opposite direction. The return trip is no freewheeling coast-fest by any means - all those aforementioned rollers await you on the "descent". But yet again I digress! The climb back out is a nice grinder, obviously the same steady 9% for 4 miles but heavily shaded all the way so that was nice. I mention this sidetrack as it's fun both up and down and is the only (paved) option besides the main road in this entire area of the canyon region. The return trip is scenic and all, but riding-wise nothing to get too excited about. I went back down the same way, again for lesser traffic considerations. With it's more pronounced grade variations, the WC side down would maybe be more exciting, but the last 11 miles descending the way I went down were plenty of fun, although again I was wishing I was on the Mighty Tarmac for maximum pleasure potential. Next time! The route out of Poipu to Hwy 50 is a gradual uphill but no shoulder and constant traffic made for an uneasy ride. The road surface is excellent everywhere and despite heavy traffic I had no close calls. Hwy 50 has some serious traffic BUT quite a generous shoulder so it is "rideable" but if you like some serenity when you ride (like me!) this is more of "transfer" ride to get to the meat of the route. (We have driven at different times on these roads and time-of-day makes no difference...it is busy!). The climb proper starts in Waimea on Waimea Canyon Rd. There are lots of places to top up on water etc here. I appreciate the subtle small street signs for these climbs vs. big loud obvious ones....makes me appreciate my attention to detail to route and challenge. Having said that, 30 minutes later I was rueing my LACK of attention to detail regarding the actual challenge and distance to various landmarks. The road is super windy with lots of blind corners, but the views are spectacular! I stopped twice on this section - I told my wife it was to soak up the scenery but in fact a couple of the ramps were just plain flippen brutal. Only three minutes stop time on the entire climb though...not bad for me but I guess I will have to keep my day job. Riding gives me a better appreciation of things like environment, geography and some history. Just riding this section it was obvious this was an older road - no one makes roads steep like this and as windy any more and the homes you pass at the start are quite authentic. This is where I wished I knew how far it was until I would hook into the other road - feeling the climb would ease off a bit. 11 km was the answer. Once you hit the intersection with Kokee Road life gets a tad more reasonable. It certainly isn't easy...or even moderate...it is hard work the rest of the way but no slopes that make you think of taking a break. 20 more km up - again I wish I had looked a bit more closely at the route before starting...a lesson learned although I seem to forget this lesson quite often. The road is tree-lined with some shade, but it was still very warm-to-hot and you are exposed most of the way. Oddly, there is more canopy near the top....I consumed a few gels and almost two bottles of water for the excursion and that seemed to be sufficient. (the buffet breakfast at the hotel was, no doubt, still being processed). I only saw one rider all day - he was heading down and I know what he was thinking..."I'm glad I am not you, buddy!". If a motorist had slowed down to chat I would have asked how far to the end, but, thankfully, no one wanted to chat with me - all the better as part of me wanted to act like I knew what I was doing. There are several View Points, but I didn't want to stop - getting going again is typically a real pain for me and I will very likely drive up with the family later in the week so lots of photo ops. Near the top on the left is rest stop with a restaurant complex but I elected to trudge on - again thinking the real end isn't too far. The last ten km has some slight downhill sections which were a welcome respite. I had Google mapped the last parking lot - of course it was nowhere in sight - lots of undulations at the top and truth be told I told myself just one more up and if I don't see the end I am going back - lucky for me the last little 200m ramp was to the mythical parking lot full of minivans and convertible Mustangs. A quick picture of the park sign and a couple more gels and gladly pointed my rented machine downhill. (As a side note, the rental bike was quite good - 28 mm Continentals - I ride 25's but totally get why they outfitted it with the big ones. Disc brakes...worked flawlessly although the rear caliper was loose and rattled the entire way - I am too chicken to try and fix it for fear of seizing the brakes or just out right FUBARing it. The saddle however was killing my backside - I sit on a Brooks Team Pro usually which I will propose too as soon as I get home. Sincerely. I can ride all day on that goddess and just feel like I have been sitting on a La Z Boy. The only downside of downhill is I miss out on the scenery - I stopped a couple of times to take some snaps - an hour of downhill is quite alien to where I come from and I was somewhat relieved to reach sea level again. I am a sub average descender - very tentative - I turned onto the new road for the last part of the descent and found it to have a smooth gradient descent with an excellent surface, but, again, no real shoulder.....would have been cool if they had put one in at least on the uphill side. The ride back to Poipu was loud and somewhat harrowing in parts. I might try this ride again but I will sample Kokee Rd. on the way up - I think it is cheating but saylavee . . . I am on vacation. If I had one suggestion it would be to drive to Waimea and ride around there to warm up then hit the climb - lessons learned, and all . . . . The alternate and a bit less scenic (for the first leg) of the 2 Waimea Canyon approaches. The last 12 miles of this climb overlaps with the Kokee approach.